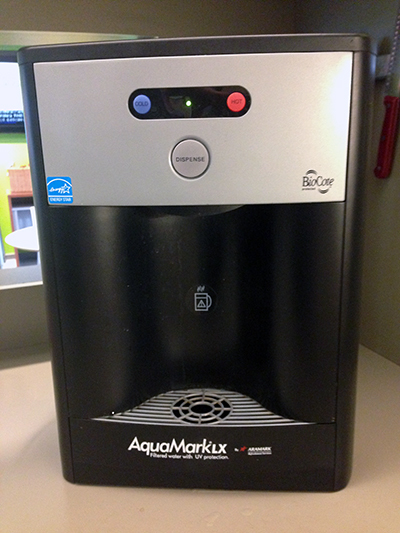 Behold, the water cooler, counter-top style–one of several versions in my office. What’s a little nutty about this particular design (and why I’m bothering to mention it) is that despite how basic it actually is (cold or hot water), the actual process of getting the water to dispense always gives me a little cognitive hiccup, no matter how many times I’ve used it. 4 out of 5 times I stand and hold the “Cold” button for several seconds, expecting water to fill my glass, and nothing happens. Then I remember I need to push the “Dispense” button. It drives me nuts. Particularly when the other water dispenser, a floor model, dispenses water when it’s “Cold” button is pushed. If the buttons are intended to select the water temperature prior to dispensing, why do they have to be buttons that look like they’ll dispense water when pushed. They scream it. Why not a little semi-raised version that looks more like a selector than a dispenser? I did a quick audit of small-ish, counter top water dispensers and the “less-buttony/more selecty” design seems more appropriate for the intended function. 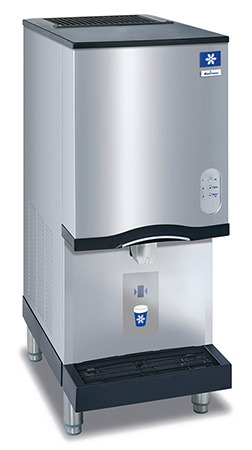 Manitowoc water and ice dispenser. 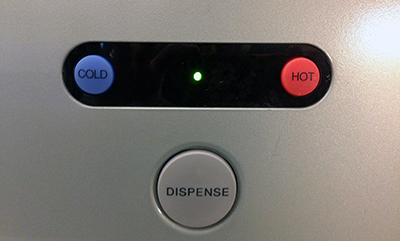 Note that the “selection” buttons are above and to the right of the dispenser. Got a similar water cooler or misuse of physical buttons story (or rant)?